Neurodegenerative and relative diseases have become the main priority of health authorities in developed and developing countries. In France only, about 860,000 persons suffer from the Alzheimer syndrome with 220,000 new cases reported each year, whereas more than 120,000 persons are affected by the Parkinson disease. However, in its latest report, the « Haute Autorité de Santé (HAS) », clearly underlined the lack of efficiency of the current treatments, that are more palliative than therapeutic. This is especially true when diagnosis comes too late, i.e. even at the first signs of memory and/or motricity loss. The HAS also underlined that screening and diagnosis methods for these pathologies have received too few novel scientific investigations over the last decade. NEMRO project is part of the challenge of "Health and Well-Being" in its principal axis "Biomedical Innovation". It deals with the relationship between the neurodegenerative diseases and the olfactory deficiency. Several recent clinical studies (often statistical studies) have demonstrated an existing correlation between the loss of smell and the appearance of these pathologies. The olfactory deficit is a reliable precursor sign of a possible neuronal degeneration. Despite this significant advance in the understanding of neurodegenerative disease and related disorders, few ambitious scientific research to understand the origin, evolution and possible means to reverse these diseases by targeted therapies. The reasons for these studies remained at a clinical stage are many and varied. It is particularly difficult to access the olfactory mucosa located at the termination of the nasal walls with a diameter less than 3 mm. In addition to this is the lack of characterization/visualization techniques of the olfactory cells whose individual size is about a hundred micrometers. NEMRO plans to develop a nasal endoscopy system equipped with a fiber-based OCT (Optical Coherence Tomography) imaging system. This nasal endoscope consists of a miniature robotic system (the diameter is less than 2 mm) and flexible. The design of the robot will be based on the use of a hybrid actuation: remote by a specific mechatronic system and an embedded actuation based on the use of electroactive materials (polymers). This system will provide an in-vivo dynamic characterization and non-invasive technique to perform 3D high resolution images (3D optical biopsies). 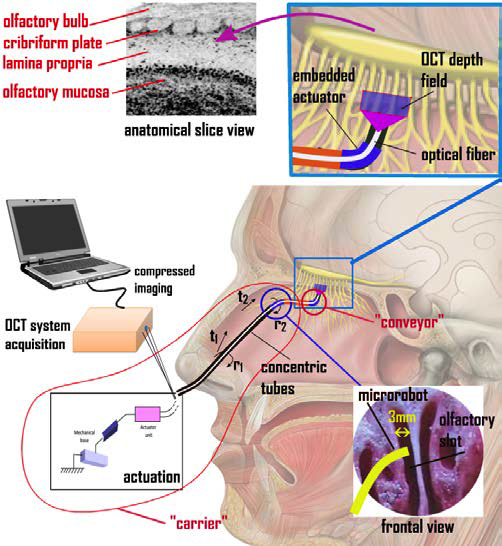 These approaches will allow analyzing, with high accuracy (in 3D), the shape and the texture of the olfactory system, similar to histological studies. In a short term, this system gives a unique and reliable experimental investigation technique to understand/diagnosis of certain neurodegenerative diseases. It will also monitor the evolution, over time, the loss of smell and its effect on neuronal degeneration. Through these medical goals, breaking with current practices in the diagnosis of neurodegenerative diseases, NEMRO will be a project with a high scientific potential, which can lead to significant breakthroughs (better understanding of olfaction, early diagnosis, etc.) and open new ways for scientific research (effective therapy). In addition to this, NEMRO provides high-level scientific contributions: intrinsically safe micromechatronics design, OCT-based control schemes, applied mathematical methods for Compressed Sensing. It will also be the same for technological innovations and contributions (miniature and flexible robotic endoscopy with hybrid actuation remote/embedded).